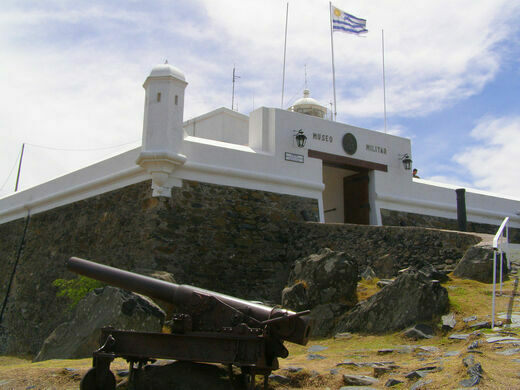 This historic fort overlooks Montevideo and appears on Uruguay’s coat of arms. Fortaleza del Cerro sits atop the highest hill in Montevideo. For more than a century, it has looked over the city and the bay, a witness to many of the events that have shaped the Uruguayan capital. An epic sculpture depicting a wagon and straining oxen. In 1806, British forces began prowling the Río de la Plata, an estuary between Argentina and Uruguay controlled by the Spanish colonial Viceroyalty. The British invaded and occupied Buenos Aires in June of that year, captured the city of Montevideo in February 1807, and again invaded Buenos Aires a few months later. None of these attempts at taking permanent control of Spanish possessions along the Río de la Plata were ultimately successful, but they certainly made the Spanish rethink their defenses. In 1809, Francisco Javier de Elío, a Spanish soldier and then governor of Montevideo, ordered the construction of fortifications on top of Cerro de Montevideo. At 433 feet (132 meters) above sea level, the summit of Cerro de Montevideo offered a strategic vantage point above the city and overlooking the bay. It was also home to a lighthouse, built in 1802, which itself served an important role not only for navigation but for sending warning messages to ships out at sea using a system of flags. Initially, only a limited set of simple fortifications were to be built around the lighthouse. But the need to defend the bay required more than a lighthouse, and so the Spanish decided to build a fortress whose walls could accommodate larger artillery pieces. Construction of the fort began in 1809 and was finished in 1811. The first artillery test took place on February 25, 1811, with the new fortress firing its four cannons and two howitzers out into the bay. 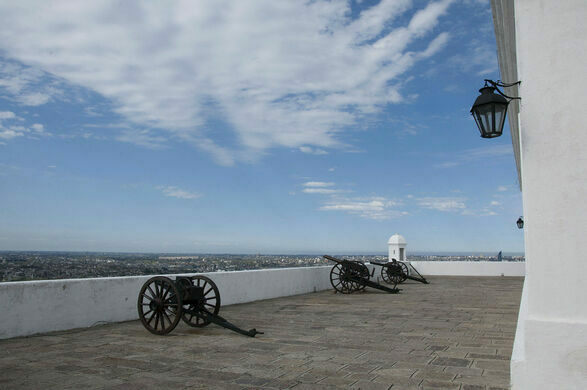 It was not long until the Fortaleza del Cerro became embroiled in the colonial struggles of the era. Cities and settlements along the Río de la Plata had been rising up against their colonial overloads since the May Revolution of 1810 in Buenos Aires. In 1814, patriot troops besieged Montevideo and took it from the Spanish loyalists, marking the end of the Spanish presence in Uruguay (and also making the Fortaleza del Cerro the last Spanish fort built in the country). But Uruguay’s fight for independence was far from over. In January 1817, the fortress was overwhelmed when a force of 10,000 Portuguese troops took Montevideo, and the Portuguese Kingdom of Brazil took control of Uruguay. The Brazilian Empire then became independent of Portugal in 1822, and the Brazilians found themselves in charge of Montevideo. Patriot forces again surrounded Montevideo in 1825, and took the fortress from the Brazilians on February 9, 1826. In 1828, Uruguay was officially recognized as an independent state. A year later it adopted a new coat of arms, with the Fortaleza del Cerro featured in its upper right quarter. Then came the Uruguayan Civil War, known as the Guerra Grande, which lasted from 1839 to 1851. The fort never fell during this period, but the lighthouse was damaged and later repaired. The next major event in this lengthy period of change and uncertainty came in 1870, when the fort was taken during the Revolución de las Lanzas (Revolution of the Lances), an armed movement led by Timoteo Aparicio, leader of the National Party of Uruguay. The taking of the fortress during this last conflict raised doubts as to its continued effectiveness in defense of the city. In 1885, Máximo Santos, then President of Uruguay, ordered a feigned attack on the fortress as a test of its abilities. Unfortunately, no one told the garrison about this, and the fortress opened up with live fire on what it assumed were hostile forces. Luckily for all involved, no one was killed in the messy incident. That was pretty much the end of the Fortaleza del Cerro’s role as a functioning military fortress. It served as a military prison from 1895 to 1907, and was declared a National Monument in 1931. A military museum was established inside the fort in 1939, and since then its primary role has been as a tourist attraction, a fittingly tranquil retirement for a fort with a long and turbulent history. 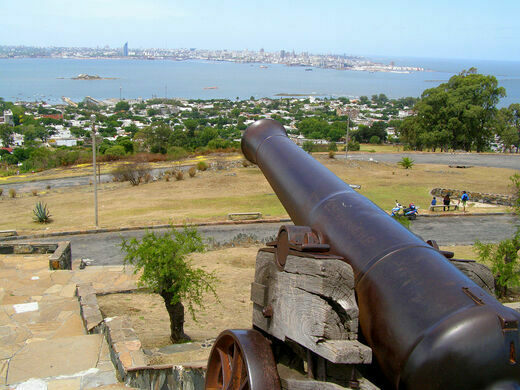 Fortaleza del Cerro, also known as Fortaleza General Artigas, is located on a hill just to the west of Montevideo and across the bay from Cuidad Vieja (the Old Town). You can get there by taking bus 124 or 125 from the city center, which will drop you off at the Terminal Cerro, from where you can take a taxi, take the 18L bus, or walk to the fort. The fort is open Wednesday to Sunday from 10 a.m. to 6 p.m. in the summer, and 10 a.m. to 4 p.m. in winter. The entrance fee is 20 Uruguayan pesos, which is less than $1 US. The remains of Uruguayan hero José Artigas lie beneath a monument in Montevideo’s main square. Where sweethearts leave their love locks in the Uruguayan capital.